Tennis courts are available to hire at Samson Recreation Centre by phoning the office on 9432 9992 on Monday, Wednesday or Thursday. If you wish to hire a court outside these times, please contact Fremantle Leisure Centre on 9432 9549 who will book your court over the phone for that day only. To check when our courts are available, please check the tennis court availability. Make sure to select the date you want to check for availability at the top of the page. The cost of courts during the day is $11.00 per court per hour for non profit organisations or $14.00 per court per hour for commercial bookings. The cost during evenings (including lights) is $14.00 per court per hour for non profit organisations and $17.00 per court per hour for commercial bookings. Summer Tennis Special – December 2018 – EXTENDED now to April 2019!! Once you've made payment for a court, you will be given a code that will give you access to the court key for that day. 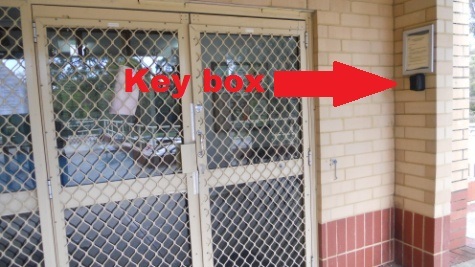 The key is kept in a secure box to the right of the front doors of the centre. Enter the code on the box to gain access to the key. Lights are available to use if you decide to book the courts in the evening hours. 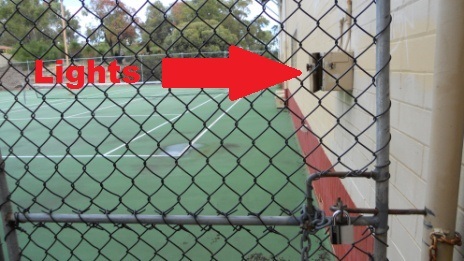 You'll find the light switches on the right just after you walk through the tennis court gates.